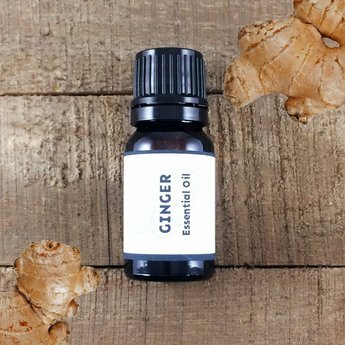 Our fresh Ginger (Zingiber officinale) essential oil is a colorless to pale yellow liquid displaying a tangy, warm, fresh, citrusy top note, with a spicy yet sweet, woody undertone. A warming essential oil that improves mood, circulation, digestion and flatulence. It is also a general simulant yet relieves aches and pains. Direct Palm / Nasal Inhaler: Place a drop of oil in the palm of your hand, gently rub the hands together, cup your hands around your nose and take a deep breath in through the nose. You can also add several drops to nasal inhaler and breathe in throughout the day. You can repeat multiple times though out the day (add lemon for stimulation). Add to a carrier oil such as apricot kernel or sweet almond (1% or less) and rub on abdomen or apply as a compress to relieve stomach pains (great to add to peppermint). Atlas cedar, cinnamon, clove, lemon, mandarin, neroli, patchouli, rose, sandalwood, sweet orange, vetiver, ylang ylang. Ginger is native to Asia. In Oriental medicine ginger is used in about half of the herbal formulas. In the 16th Century King Henry VIII recommended ginger as a remedy for the plague. Cautions:May irritate skin. Use in the lowest concentrations.